The trigonometric identities worksheets consist of a collection of all the frequently used formulas, offering a blend of degrees and radians to practice them. For easy navigation, the exercises are classified based on the identity used, into fundamental trig identities, even-odd functions, periodic identity, sum and difference identity; formulas like half angle, double angle, product to sum and sum to product and more. 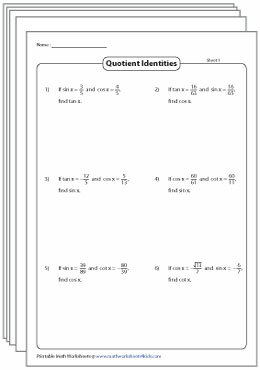 Familiarize learners with quotient, reciprocal, cofunction and Pythagorean identities. 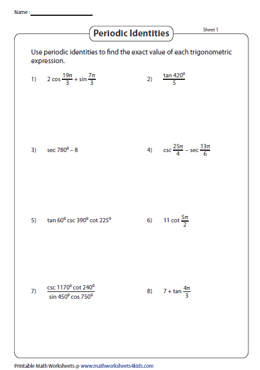 Practice evaluating and proving expressions using the fundamental trigonometric formulas with these worksheets. Introduce the odd (sin, tan, cosec and cot) and even identities (cos and sec) with the help of the odd and even identities chart in these trigonometric identities PDFs. Find the exact value of trigonometric functions as well. Equip yourself with a knowledge of periodicity with the periodic identity chart. Employ the periodic identity to comprehend the periodic behavior of the six trig functions, and to find the value of trig equations. Find the exact value of the trigonometric ratios whose angle measure can be split as a sum or difference of two familiar angles expressed in terms of sin, cos and tan. Simplify, evaluate and prove trig expressions. 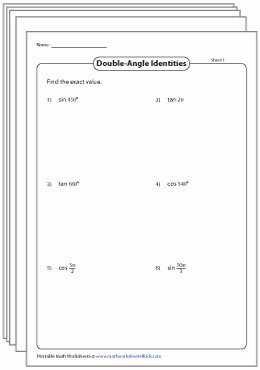 This array of worksheets has trig expressions whose angle measures can be transformed into known angles by doubling or halving the angle. Included are expressions to be evaluated, simplified and proved. 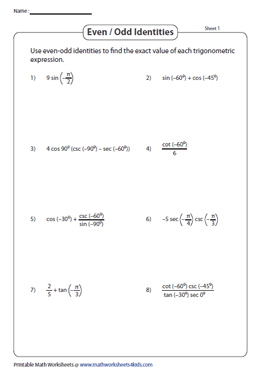 This worksheet stack consists of trigonometric formulas to assist in simplifying a trig expression by converting a product to a sum or a sum to a product, simplify, evaluate and verify trig expressions as well.